Robin's Green Shades: Happy Birthday Robin! June 19th is always a special day for all of Robin's Fans around the world. It's a day that reminds us who brought us all together in the first place, who made it possible that people from all different countries could meet, become friends, even meet in person if they got the chance to. I am one of these lucky people, and since 2010 when I opened this website, I've been lucky enough to live some amazing experiences thanks to you, Robin! Today it's your day, and I hope you'll have a serene Birthday, surrounded by your loved ones. 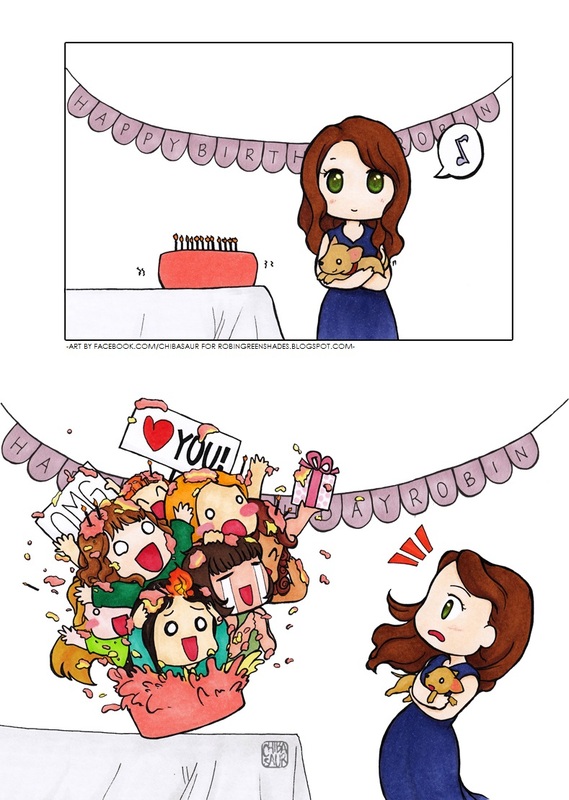 We, the fans, are sending our wishes of a Happy Birthday, along with our love. You mean so much to us, we are so proud to be your fans! We can't wait to support you in all your future projects, certain that you will give your special touch to all the characters you're going to play, just as much as you did with our beloved Teresa Lisbon, and all the other characters you have amazingly portrayed over the years. I am so grateful for everything that you have done for us, Robin, we are so lucky! 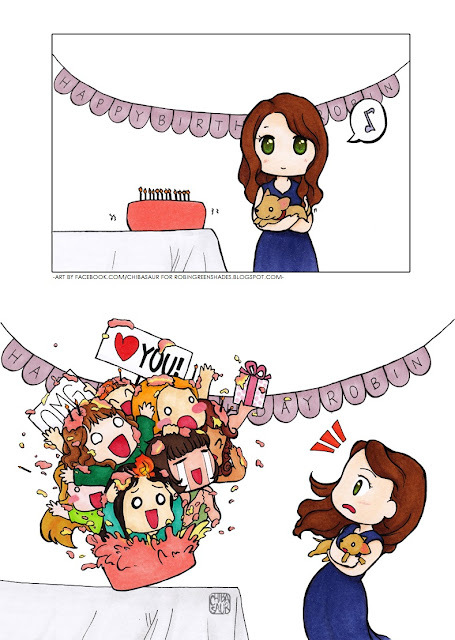 And this is how I picture a Birthday party for Robin with the fans... Just for fun, of course. In real life, we would be much more calm and relaxed... I think! ;D My dear friend Chibi helped me put the idea into this beautiful drawing! And since this is the last day of the Tunney Week, we have to make it special! We will be trending on Twitter - Happy Birthday Robin Tunney - at 11am EST. You can check this poster out for all the different timezones! I hope you will be there with us, to celebrate all together Robin's Birthday! Talking about the Tunney Week, I just wanted to say how wonderful was for me to be part of it this year again. I love to share this week with the other fans, on Twitter, on Facebook sharing the things we like the most about Robin, talking about her movies, her characters, and so on. It makes me feel closer to them, even if we live so far away from one another. I wanted to thank the girls with whom I share this project, and who made it possible this year again: Andrea, Van, Grace, Sarah, Amy, Kyleigh, Amber. And, Robin Fans, even if the Tunney Week is almost over, you still have time until June 30th to send over to this email: tunneyweek1@gmail.com your messages/letters, drawings, fanart in general, anything you want! A little update! The #TunneyWeek is over with almost 3,000 tweets so far, and almost 2,000 tweets just for our trending time for Robin's Birthday!! It's been amazing, so thank you to all the fans who shared this day with me!! I had the best of times!